The Utah Jazz traveled to Los Angeles to take on the Clippers in their final regular season game of the season, though only one of the three most notable things about the evening actually happened on the Staples Center court, where the Jazz fell 143-137 in overtime Wednesday night. First, the Jazz held out the majority of their core players after locking down the No. 5 seed by beating Denver Tuesday night. Donovan Mitchell, Rudy Gobert, Derrick Favors, Ricky Rubio, Kyle Korver and Raul Neto did not suit up against the Clippers. Second, there was a large amount of scoreboard watching going on throughout the game, as Portland (down 28 points) and Denver (down 11 points) each overcame double-digit deficits to defeat the Kings and Timberwolves, respectively. 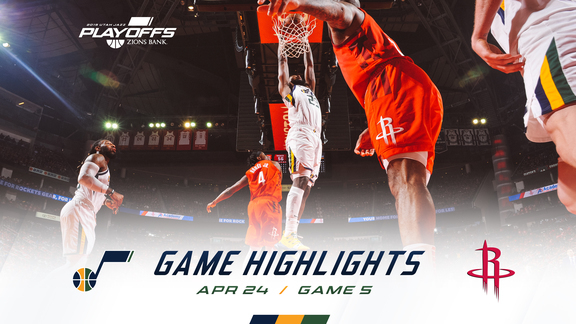 As a result, the Jazz will match up with the Houston Rockets in the first round of the playoffs starting Sunday evening. Finally, Grayson Allen scored 40 points against the Clippers. That's right, Allen—who spent much of the season shuttling back and forth between the Jazz and the NBA D League's SLC Stars so he could maximize his court time during his first year in the NBA—became the second rookie in as many years (the other being Mitchell, of course) to register a 40-point game. Georges Niang also set a new career high with 24 points for the Jazz (50-32), while Jae Crowder added 17 points in 16 minutes. Ekpe Udoh (14 points, 13 rebounds, five assists, four blocks) and Tony Bradley (15 points, 10 rebounds, two steals, two blocks) each double-doubled in the loss. 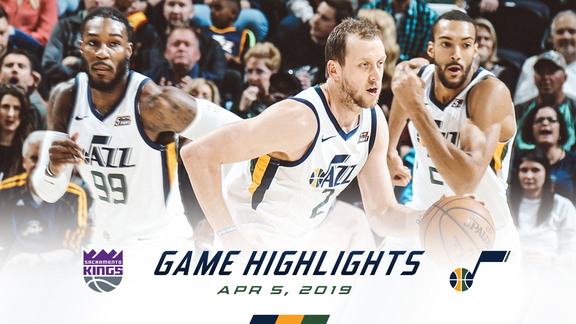 The Jazz erased a 17-point first-half deficit and then went on a 10-4 run to close the fourth quarter and force overtime. LA, though, outscored Utah 17-11 in the extra period to claim the victory. Montrezl Harrell (24 points, seven rebounds, five assists) and Ivica Zubac (22 points, 11 rebounds, three blocks) led ther way for the Clippers (48-34), who will enter the playoffs as the No. 8 seed. They'll face the defending champion Warriors in the first round. For the third time in a week, Allen set a new career high in scoring, increasing his output from 14 against the Suns last Wednesday up to 23 on Friday against the Kings, and finally to 40 tonight—though it feels like this one will stick for a while. The rookie shot 11-for-30 from the field, including 5-for-13 from beyond the arc, and 13-for-14 from the line, and he added seven rebounds, four assists, one steal and one block in 41 minutes. Allen reached 40 points in the final minute of overtime when he converted a four-point play, hitting a corner three and then the ensuing free throw. Joe Ingles may have played only 14 minutes, but it was more than enough to extend his NBA-best consecutive games streak to 304. Ingles has not missed a game since December 16, 2015. The Jazz shot it well from long distance, going 14-for-35 (40.0 percent) from beyond the arc. Allen (5-for-13), Crowder (4-for-6) and Niang (2-for-6) each made multiple threes. "As far as Houston, we haven't had a chance to process all that. We obviously played them in the playoffs last year and know how good they are. They're a terrific team and we know how difficult the series will be. We have to defend and compete, and that's what we'll do." The Jazz went 21-20 on the road this season. ... Clippers broadcaster Ralph Lawler retired after 40 years and 3,229 games with the team. ... Utah shot 29-for-33 (87.9 percent) from the free-throw line. ... The Clippers outscored the Jazz 76-52 in the paint. ... Danté Exum (knee) remained out for the Jazz. ... 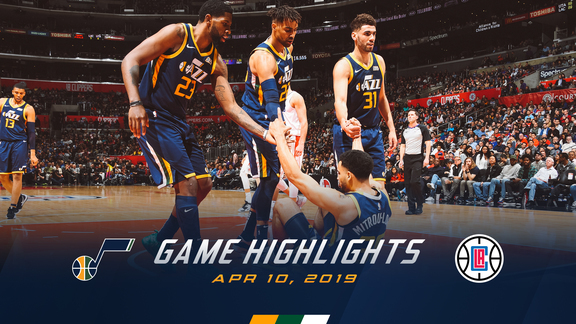 The Jazz won the season series 2-1. ... Utah blocked 11 shots. 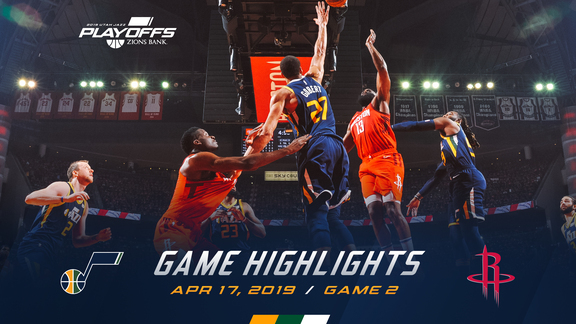 The Jazz will travel to Houston for Game 1 of the first round of the 2019 NBA Playoffs on Sunday. Tipoff is set for 7:30pm MT, and the game will be broadcast nationally on TNT.